Moose, Eh? 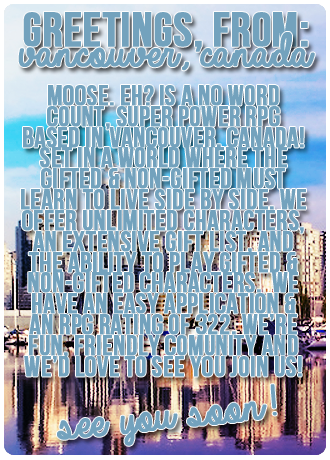 is a brand new gifted role play based in Vancouver, Canada. It focuses mainly between the politics and prejudices between gifted/super powered people and regular humans during a time where gifted people face winning or losing their rights to their own bodies and the right to use their gifts. Here at Moose, Eh?, players have the choice to play gifted and non gifted humans alike, from any age. We have an extensive gift list and are open to suggestions to our list, too! We have no word count and an application process. We're very open minded about play-bys/face claims; as long as we can do a search for the face, we'll allow it to be used. We're a small, laid back, welcoming community ready to welcome you and have fun! Hope to see you there!